Past Aetherius Society Members..... Leaving the Aetherius Society Behind! : SETI doesn't believe in UFO's! If there's one thing you can be sure of, its certain that these telescope arrays and so forth are not there merely to search for the odd UFO - or even ET. Astronomy is the game at SETI and UC Berkeley, nothing else, uhh. If they can persuade you to part with some computer time, it to their advantage in a big way. This email (below) might have shocked some of those in Silicone Valley who fund that research..... but think of a Creative Principle or Original Cause which is behind even the "Big Bang" and the creation of Its universe. That is to say that science has now accepted that there is a "god" and a "creation". Pity that they are still so subject to evolution here on Earth, though. Interpreting The Designer's laws is far different than trying to construct theories to suit your own self-styled ignorance. 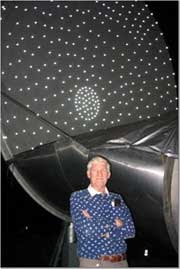 Thank you for your website invitation to comment on your SETI research. After the US bombing everywhere from Belgrade to Baghdad "back to the stone-age", you all certainly do need something to make you feel clever again. SETI is not only a "long shot" - it gives you the feeling (illusion) that you are actually calling the shots. What utter nonsense. The main problem, of course and as usual, is in the minds of the researchers. After looking for biological life on Mars and elsewhere, all you have discovered is that you have failed to discover that there is something that you don't know. That is, you have overlooked something fundamental or, more accurately, have failed to consider it. In other words, your egos have blinded you all to something right in front of you. That is typical of the human race and leads one to the clues as to why no alien intelligences have bothered to openly contact us. Given our history as a belligerent race, why would anyone of real intelligence want to? After all, wouldn't it be courting disaster to invite communication with a pack of foul rapacious bastards? That is, after all, what we are, you know, and we on Earth would be generally seen as that by anyone from anywhere else. Do we really think that other intelligences would be as dumb as, or more dumb, than ourselves? Of course, if you are only looking for protoplasmic lifeforms, how would you recognise really intelligent life from another planetary culture anyway? So SETI scientists think so? Oh? Are you sure? It has recently been supposedly accepted that the fourth dimension is time. How many generations staring at clocks did it take to work out that simple piece of information? When so-called science finally discovers that we live in a framework of at least seven dimensions (its no good just postulating - you have to actually know what that really is), perhaps then will we be on the road to the kind of discoveries that would induce alien intelligences to bother contacting us. I mean, how long will it take some "bright spark" (with suitable paper credentials, of course) to realise that the fifth dimension is motion. Clue: look at the large dial in front of you when you drive your automobile. These are, after all, all measurable dimensions in which we operate (or exist), aren't they? So, where did all those aliens go who we thought might be there in out solar system? Well, I'll ask you another question - where do "you" come from before "you" are born and where do "you" go to after "you" die. Answer: two sets of "you" ? - not really. Think about it - aren't we already all living in a multi-dimensional framework and existing in a subtle state around which we have grown a more gross physical body? Does that mean that there is more than one framework of dimensions and do we simultaneously exist in all of these or, at least, can we move between them? You find out! How? Why should I tell you? So, why wouldn't alien intelligences be more intelligent than us an why wouldn't they have discovered that it is not necessary to live in a gross form which ages and decomposes? That would surely solve a lot of social and logistical problems, wouldn't it? Then, how does one communicate with such intelligences? Again, you would have to make yourself so good in their eyes that they would want to? What!?!? That wouldn't go down well with the egos on your grants board (or wherever you get your funding from), would it? actually devise a table of elements for elements which they hadn't yet discovered, as the pioneers of your craft did (and so forth)? Yes, I think you are merely running out of ideas. Perhaps, then, you will really have to come up with some original thoughts. Oh, drat!?!? Research projects: In collaboration with other researchers and students in the Radio Astronomy Laboratory and Astronomers at the Universities of Maryland and Illinois, we have developed a Michelson Interferometer Array for millimeter wavelengths at the Hat Creek Radio Observatory of the University of California, located near Mt. Lassen in the northern part of the state. This instrument can form high-resolution images with good spectral coverage of regions of star formation. What we "see" is radiation emitted by trace chemicals in each dust cloud: HCN, CO, etc. The pictures show remarkable objects and processes such as energetic winds and outflows ejected from protostars and massive, rapidly rotating gas clouds with disk shape that are probably the early stages of star clusters. This instrument has operated as the Berkeley Maryland Illinois Association Millimeter Array since 1988. At the present time, this instrument is being combined with a similar array at Caltech which will be located at Cedar Flats in the Into Mountains of southern California. The new combined instrument will be known as CARMA. A new activity at the Hat Creek Observatory in which I am involved is the development of a novel large centimeter wavelength radio telescope, the Allen Telescope Array. This instrument, a joint project with the SETI Institute in Mountain View, will carry out sensitive studies of the ISM and the distant universe, as well as searches for technological evidence of complex life on other planets. Farewell Good Brothers (1992): A look at the "Contactees" who, back in the 1950s, claimed to have been contacted by friendly aliens from the planet Venus. 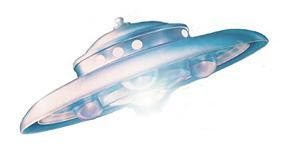 They pioneered flying saucer mythology..... includes Frank E. Stranges and George King. Does anyone have a copy of this video to upload? Indeed, "farewell" if peoples' opinions today are as narrow as the reviewer's ridiculing "their belief that the "space brothers" are offering a message of salvation for humanity..." but then, the film was made as a kind of mockery perhaps anyway?